A little more than a week after the closure of owner SlySoft, controversial ripping tool AnyDVD with version 7.6.9.1 is back. Now operating under the RedFox banner, AnyDVD and friends have skipped to Belize while offering a brand new release. Old customers can continue to use their existing AnyDVD license to watch their discs. This version can access the new RedFox Online Protection Database. For those people who are replying on AnyDVD to breake protection from Blu-ray and DVD disc, it is very essential for you to find a AnyDVD alternative in case some unexpected situations happening again. The following article will make a comparison of AnyDVD with ByteCopy (best Blu-ray Ripper Software from Pavtube) for you as a reference. As a Windows based application that removes restriction of DVD and Blu-ray media automatically in the background, the DVD/Blu-ray will become useable to your windows operating system and all programs on your computer. AnyDVD HD optionally disables RPC region codes, thereby making the movie region free and comfortably viewable on any DVD/Blu-ray player and with any DVD/Blu-ray playback software. 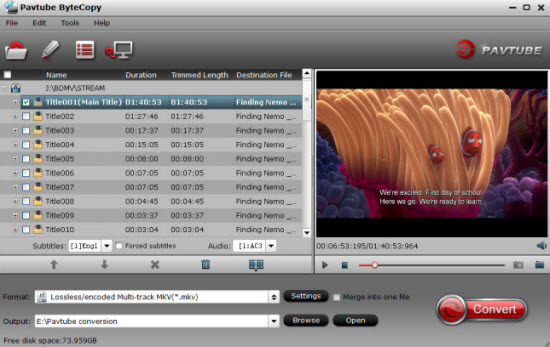 Pavtube ByteCopy has built-in decrypters that helps bypass both copy and region protections without installing any third-party plug-in, you can make a full disc copy, main movie copy, digital format or lossless digital copy of your Blu-ray/DVD movies to computer hard drive for backup or viewing on devices that can read Blu-ray disc. TIP: More DVD ripper information can help you to solve DVD problem. 1. Lossless Blu-ray/DVD to MKV backup. Free to choose desired audio tracks or language subtitles from source Blu-ray and DVD movies for better movie enjoyment.